The condition of a whale stranded in the River Thames has worsened which has scuppered plans for it to be released into the open sea. 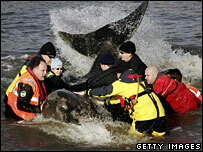 The 18ft (5m) northern bottle-nosed whale was placed in a special pontoon in shallow water near Battersea Bridge. It was then tethered close to two boats and towed to a barge which is heading for the river estuary. Experts hoped it could be let out into deep waters but the plan now is to release it off Whitstable in Kent. If the whale is too weak experts may take the decision to put it down. Tony Woodley from the British Divers Marine Life Rescue (BDMLR), which is leading the rescue operation, said the vet on the barge was "pessimistic" about the whale's chances. The vet had told him the animal was suffering muscle stiffening and was under stress due to what it has gone through and being out of the water. "The plan was to go round at least to the English Channel before it was released, but now it is just get as far out of the Thames as possible," he said. "We have the awful trade off of how far out we can take it and how long we can keep it out of the water." A BDMLR spokesman said the barge should reach the a location known as "Shivering Sands" 15 miles off the coast of Whitstable from 2100 GMT to 2130 GMT. A sighting of the whale on Saturday morning near Albert Bridge, in Chelsea, disappointed rescuers buoyed by an earlier report that it had been seen in Greenwich, which is closer to open water. 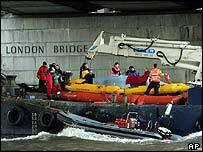 But as the rescuers moved the whale applause broke out among the 3,000 onlookers some on Battersea Bridge, which had been closed, as the whale passed beneath. It is on an inflatable raft which is functioning as "makeshift whale mattress" on which it is being constantly watered down and monitored by experts. It has been given several injections including antibiotics and earlier a vet on board the barge said the whale's had sustained cuts and its breathing was irregular. Mark Stevens, from BDMLR, said lifting the animal onto the barge had "gone like clockwork" but it was the "scariest thing I've ever done in rescuing whales". The whale, which could weigh about four tonnes, was first spotted at 0830 GMT on Friday by a man on a train and has since attracted massive public and media attention. It soon became clear there was cause for concern, as the animal came within yards of the banks, almost beaching, and crashed into an empty boat, causing itself slight bleeding. There were reports of a pod of whales in the Thames estuary earlier in the week, and it was possible that the whale had become separated from this group. There was also an unconfirmed sighting of a whale in Southend in Essex on Friday. It was the first sighting of the endangered species in the Thames since records began nearly a century ago. In an unrelated incident, what is thought to be a harbour porpoise was found dead on the banks of the Thames in Putney, south-west London, on Saturday afternoon. What happens to the whale now? Why so long to save the whale?